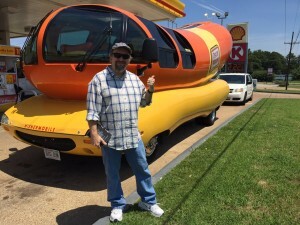 Friday I got off work early for a 2 o’clock doctor’s appointment up in Memphis that afternoon. 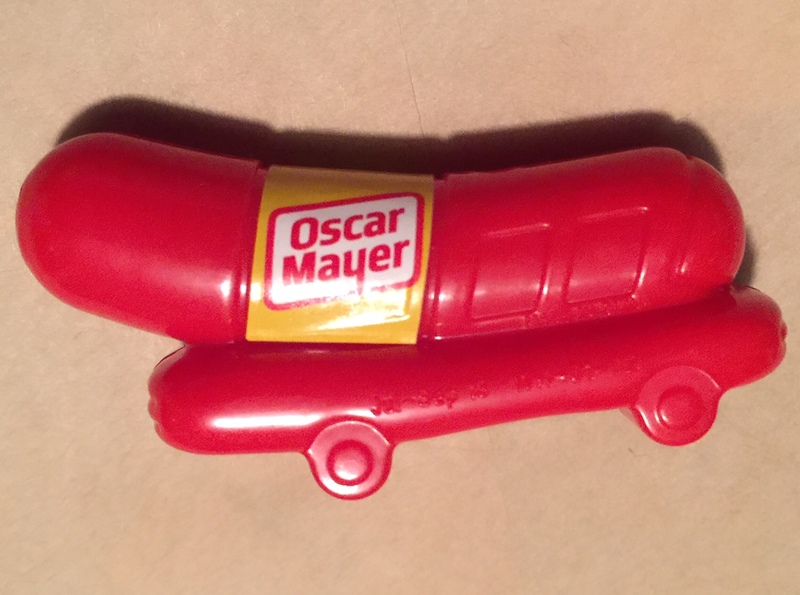 I was headed home to shower and change out of my work clothes when I saw something very familiar taking the same exit off I-55 S as I was…it was the Oscar Mayer Wienermobile! The hot-dog-on-a-bun-shaped Wienermobile turned right onto Commerce Street in Hernando, MS and then right into the local Circle K where it pulled to a stop and parked out in front of the station’s gas pumps. 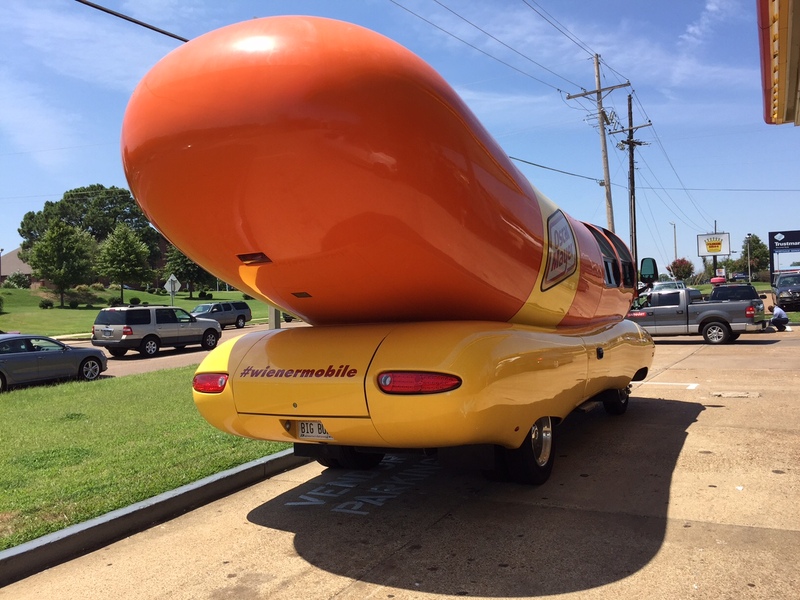 I followed and pulled into the parking lot behind it. 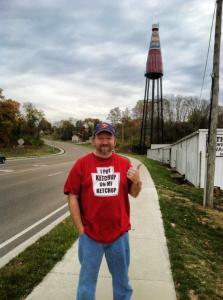 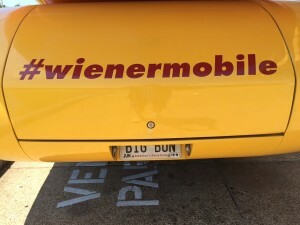 I got out and walked over to the Wienermobile and took a few pics with my phone. 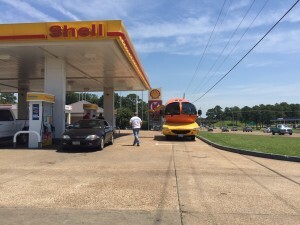 The two Hotdoggers – Molle and Jason, who had been piloting the famous vehicle had gone inside the convenience store, and after a few minutes came back out to the Wienermobile and some surprised and inquisitive locals like me. 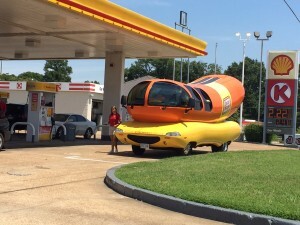 I asked them where they were headed off to and they told me they had been in Memphis and were going to be here in Hernando for the next couple hours. COOL! 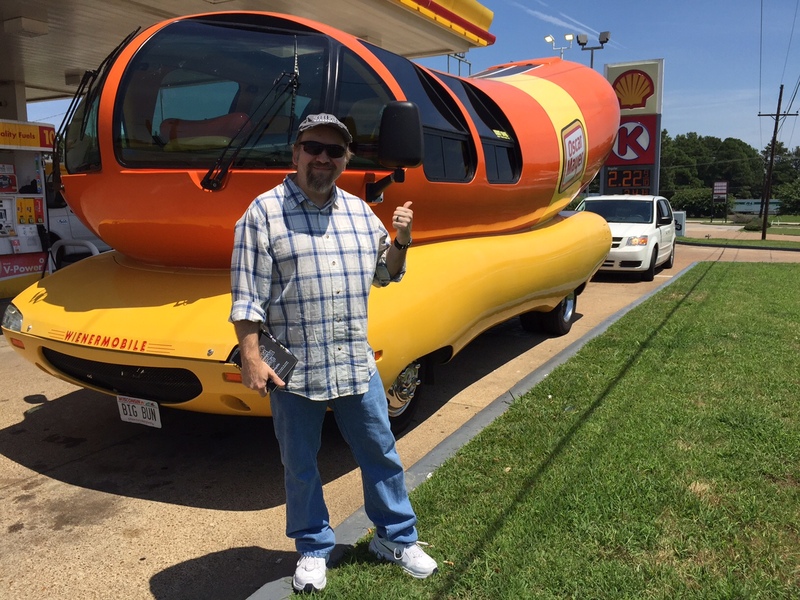 I jumped back in my car and headed home to get cleaned up, stopping back by on my way back out of town to Memphis for the afternoon. 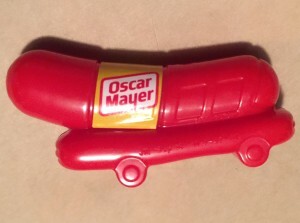 I’ve had a Hot Wheels Wienermobile for years. Today I not only got to see the real thing in person, but I got to actually go inside it! 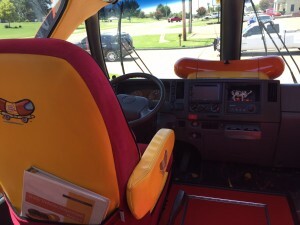 The side door opens up similar to a DeLorean’s gull-wing doors, and it was a lot roomier inside than I thought. 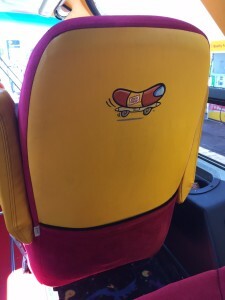 I stepped aboard and looked around- grinning the whole time. 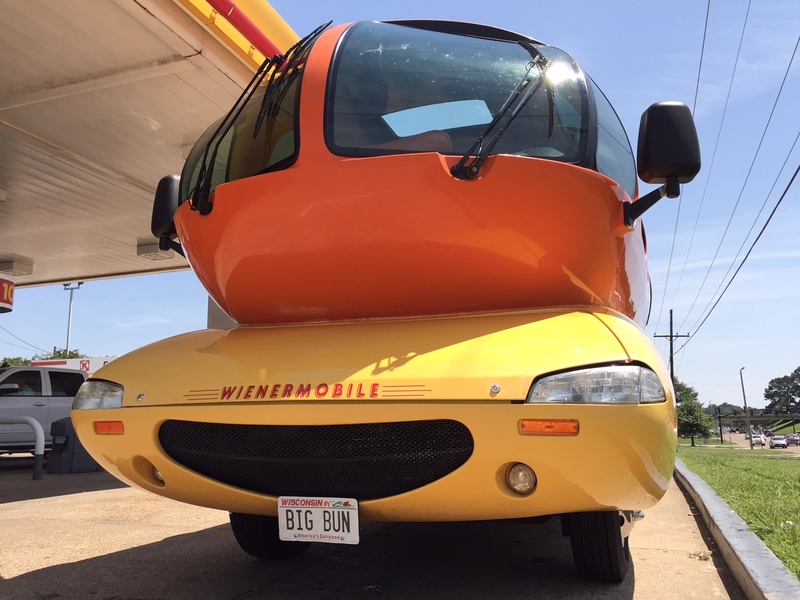 There are six Wienermobiles that travel across the country right now. 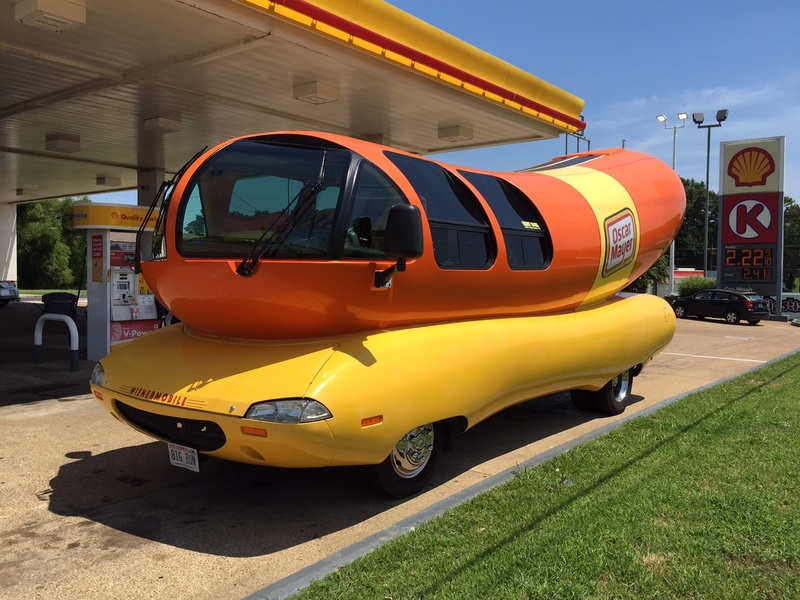 This one covers the South-East Region of the country (but isn’t limited to it), and started off on it’s journey earlier this year in Wisconsin. 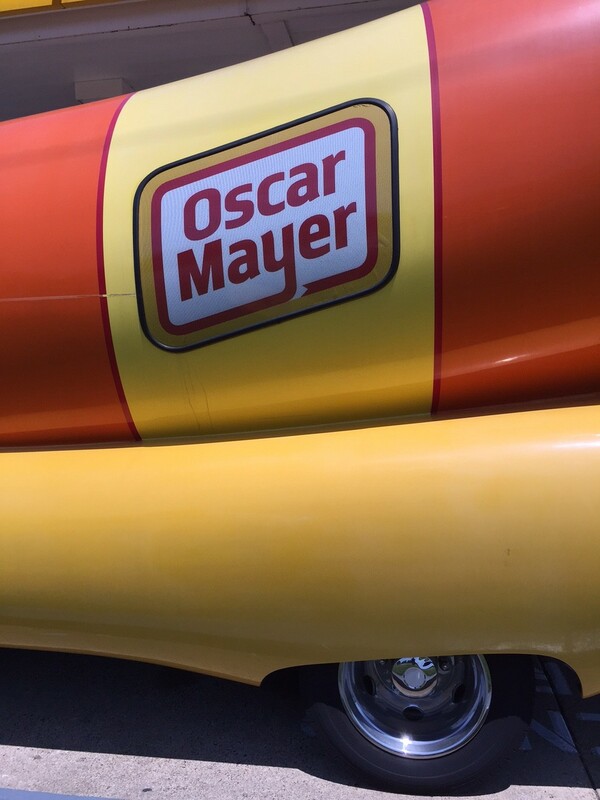 The original one was created by Carl Mayer (Oscar’s nephew), and there has been different versions traveling around since 1936. It started of as a food truck, but they are now a marketing/advertising tool. 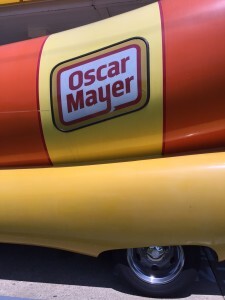 One of the older models is on display at The Henry Ford Museum in Dearborn, MI. 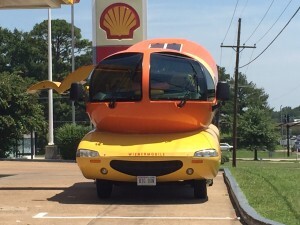 Like most cars, the Wienermobile has evolved over the years, and not only has had cosmetic changes to the exterior, but under the hood and overall size as well. Oscar Mayer has hired recent college graduates as Hotdoggers to drive the Wienermobile since 1988. 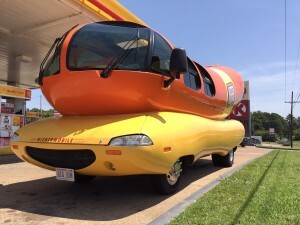 The 1969 vehicle was the first to travel outside the United States. 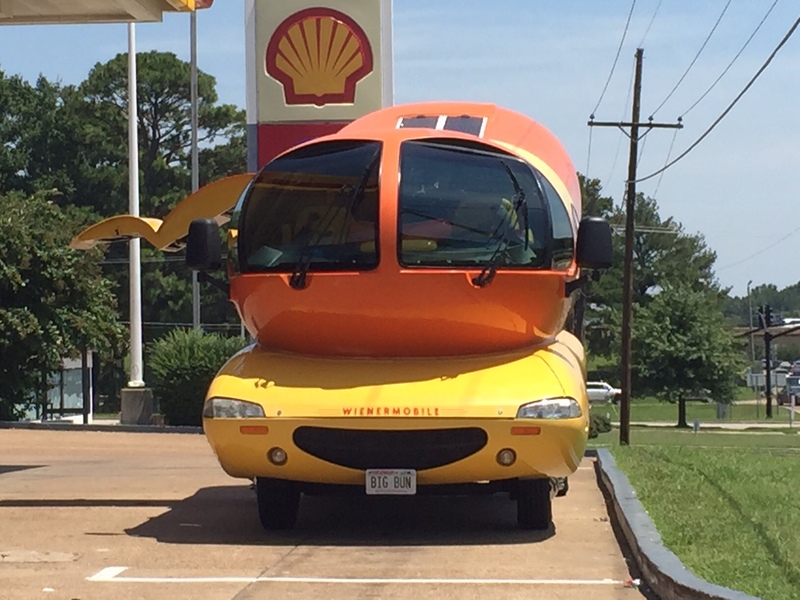 If you’re not lucky enough to see one in person, you can follow the Wienermobile on Twitter- @Wienermobile or #Wienermobile. You can also see it and some of the Hotdoggers in action here. 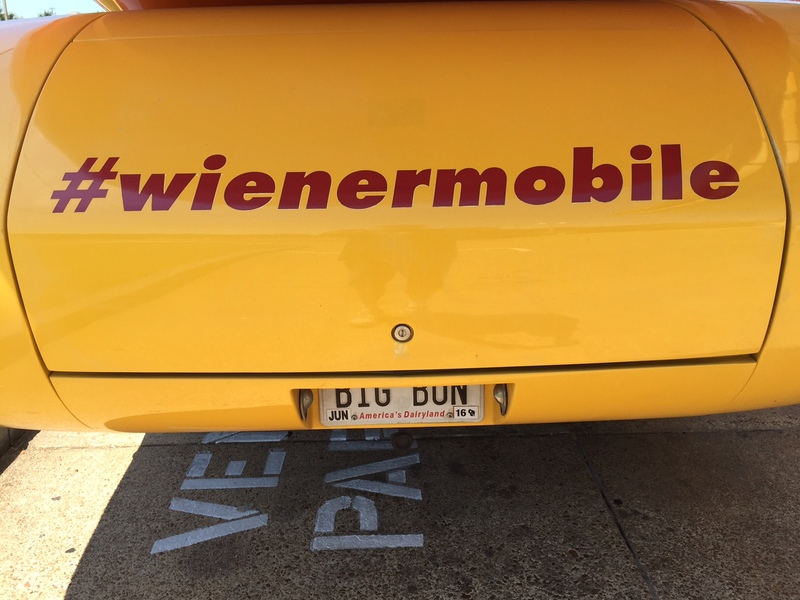 Oh, and check out the cool off-road #WienerRover on Twitter or YouTube! 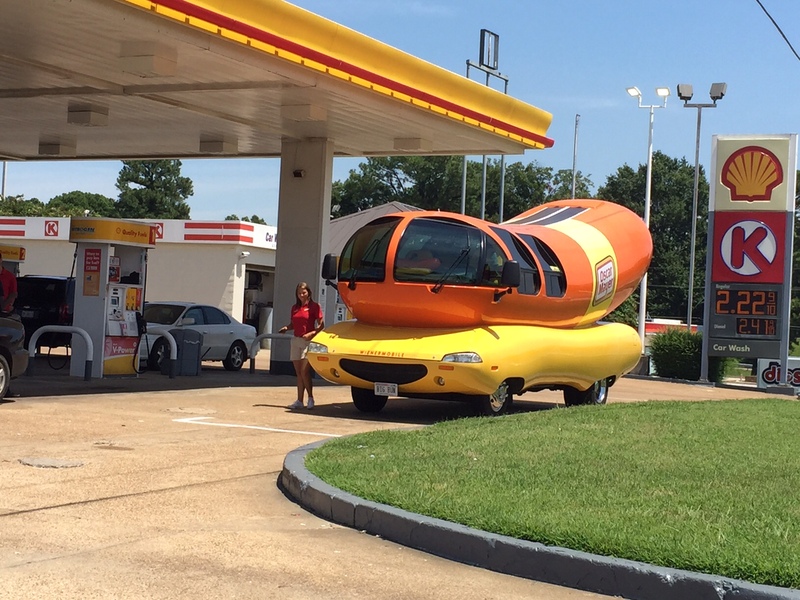 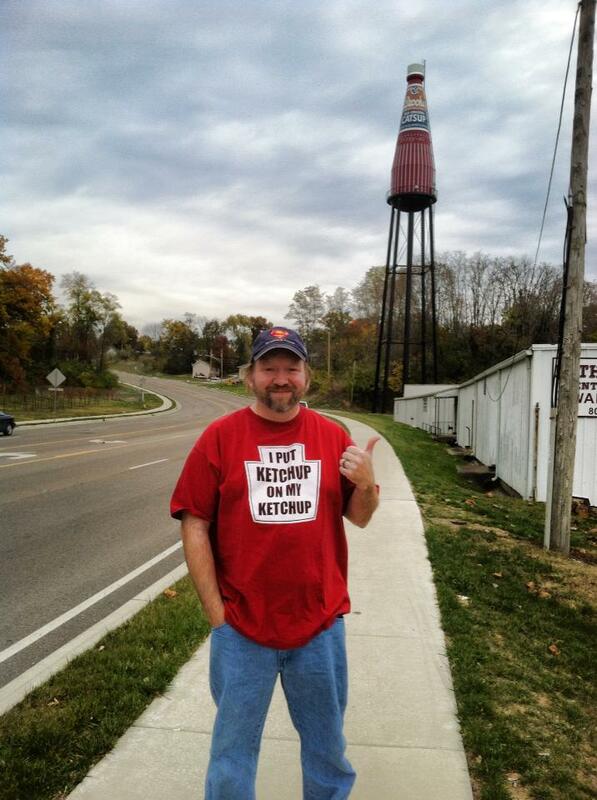 Safe travels Hotdoggers and Wienermobile– hope to see you again. 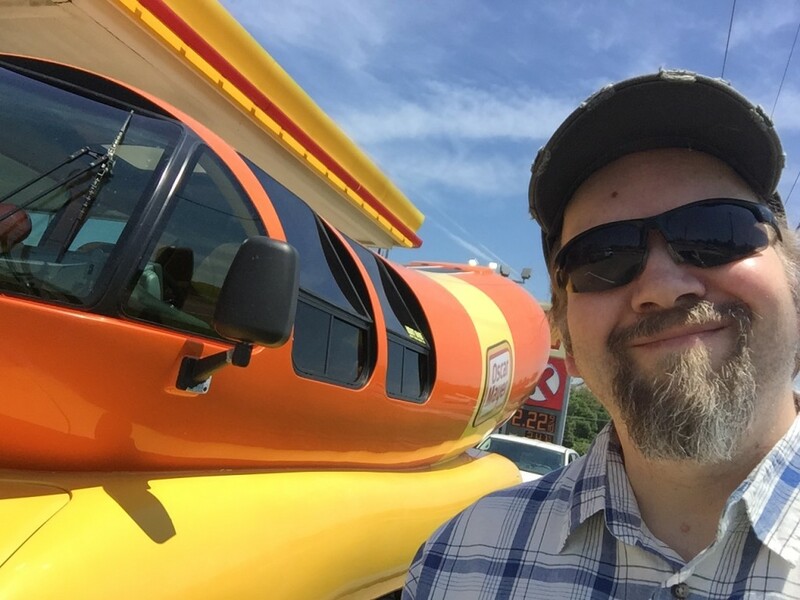 Oh- and for the record, I actually put ketchup on my hot dogs. Fun fact: Actor Jerry Maren worked as a Little Oscar (far right in photo above) for the Oscar Mayer Company in the 1950s. 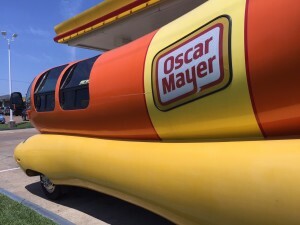 Jerry made appearances as Little Oscar on the West Coast in the world famous Wienermobile, while opening supermarkets and appearing in TV commercials and on kids shows. 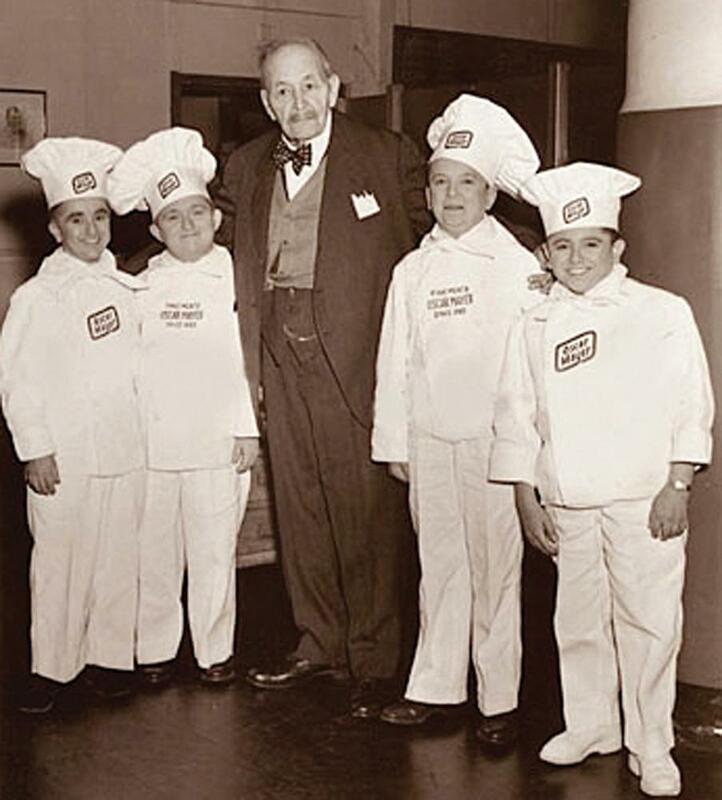 Jerry was known as one of the mole men in Superman and the Mole Men, Buster Brown, Mayor McCheese and the Hamburglar, but is probably most famous for portraying a Munchkin member of the Lollipop Guild in The Wizard of OZ. 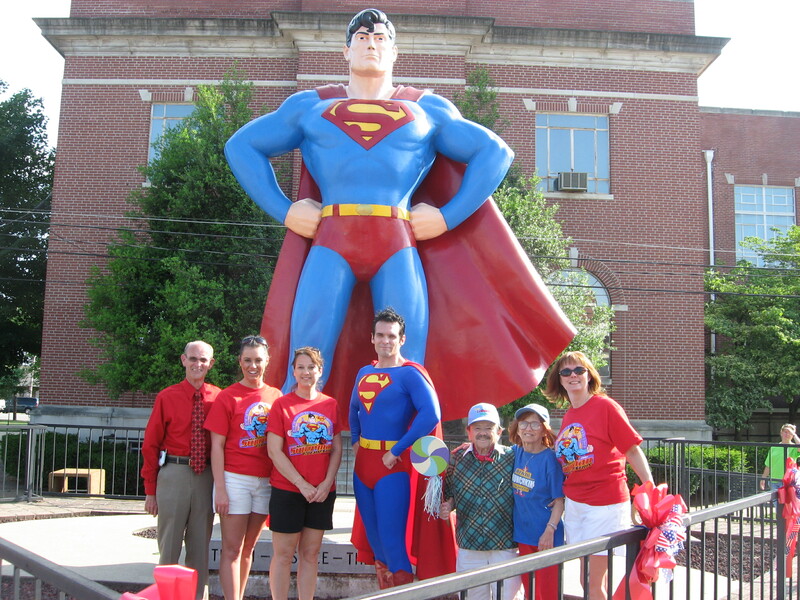 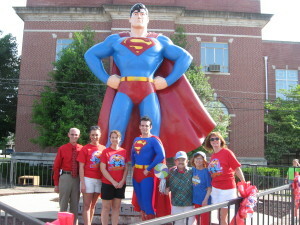 I got to meet Jerry and his late wife Elizabeth at the 2007 Superman Celebration in Metropolis, IL.